N60Sean’s Fan Request Friday is back! 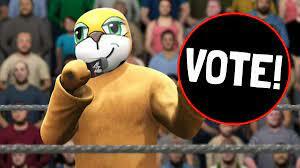 YOU choose Stampy’s Tag Team partner! Vote for your favourite this week! Imagine if the WWE was full of YouTubers, your favourite stars and characters YOU’VE created? That’s what happens in our WWE 2K17 series on the N60Sean YouTube channel! Now, we’re giving you the chance to decide what happens in our matches on Fan Request Friday – this week, YOU choose Stampy’s Tag Team partner! Last week, Stampy announced that if he doesn’t win Championship Gold by the end of Season 7… he will retire from wrestling! Stampy came up short in his N60 Championship qualifier, but now he’s set his sights on the Tag Team Championships. But who should Stampy’s tag team partner be? Vote for your favourite then leave a comment here with who you choose! Click here to submit your character for N60Mania 2! We’ve put your N60Sean fan art into a gallery – click here to check it out! Hear Sean every weekday morning on the Fun Kids Breakfast Show! With his co-host Robot, Sean’s got the latest gaming news and the best tunes around, you can also find the characters in overwatch, that’s awesome! Click to subscribe to Sean's YouTube channel and see all of his video game adventures! I choose captain sparkles because we never saw him in any matches and he never had any championship title shots before. We need more sparklez, plz. Black clothes a red head and a mask with a skull on it. And my finishing move is a power bomb but face first and its called a face plant.I am very high flying and a massive fan of Dantdm,vannos and h20delirious.I wear bright red trainers and a vannos logo on my black jacket. A big mussily armoured knight and I have a Dantdm logo on my suit and I wear blue trainers and instead of a knights helmet I wear a steel mask and my finisher is a massive head but. I vote for Henry Horsemen Because he’s the best!